Jacquard’s Pearl-Ex creates a metallic look without being a toxic metal. The different particle sizes produce different looks – from a fine, smooth, pearly luster to a highly metallic sheen. This safe, non-toxic, inert powdered pigment is extremely color fast and stable – it will not tarnish nor fade and is therefore ideal for archival applications. It can be mixed into any viscous medium and applied to any surface. Mix it into oil, acrylic, gouache, varnish, clay, melted wax and so on. It can also be spread dry on porous surfaces. Use it on clay, glass, metal, wood, paper, fabric or gourds. Mix Pearl-Ex with a clear embossing powder for rubber stamp embossing. Pearl-Ex in itself is not an embossing powder. Interference colors work best over dark surfaces. Mix 4 parts Pearl-Ex to 1 part Gum Arabic and add water to desired consistency for a watercolor paint. If mixing in a plastice well palette, this mixture can dry out and become reconstituted with water. Dust Pearl-Ex Powders onto shrink plastic before shrinking. The powder will become embedded in the surface when the plastic shrinks. Dust a polymer clay rubber mold with Pearl Ex before pressing in the clay. This is a great way to color the clay. It also makes the clay easier to release from the mold. Mix Pearl Ex with the Jacquard Colorless Extender for use on fabrics. Heat set as directed on bottle. Mix Pearl Ex with any clear medium to use over any surface. 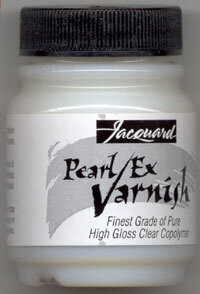 For example, you can mix Pearl Ex with a varnish, acrylic or solvent-based, as a coating over clay, wood, or paper. Knead dry Pearl Ex powder into polymer clay to color it. Pearl Ex can be mixed into glycerin soaps in soapmaking and wax for candlemaking. Pearl Ex can be mixed into a medium and airbrushed. Some testing will be necessary to ensure that the particle size will fit through the airbrush opening. Pearl-Ex Series 2 contains 12 most popular colors in 3 gm (.75 oz) bottles: aztec gold, antique copper, antique silver, duo-green-yellow, bright yellow, flamingo ping, spring green, turquoise, true blue, misty lavender, blue russet, sparkling copper.